It took me a lifetime to bear witness in person. My soul didn’t need proof or evidence to validate my vegan label but I still needed to go. I am grateful to Miss Marina Black for attending with me. The vigil was an emotionally moving experience for both of us. The vigil allowed me the opportunity to apologize for so many shameful things over the years. I am not an innocent bystander in the abuse of animals. In the name of fashion, beauty, diet and entertainment, I took part in animal cruelty. Religion is not excluded from my list. I believed kosher meat was different. Justifying the slaughter as swift and humane, I believed it was somehow better. Convinced that since Jews don’t eat every animal it’s not the same. WRONG! 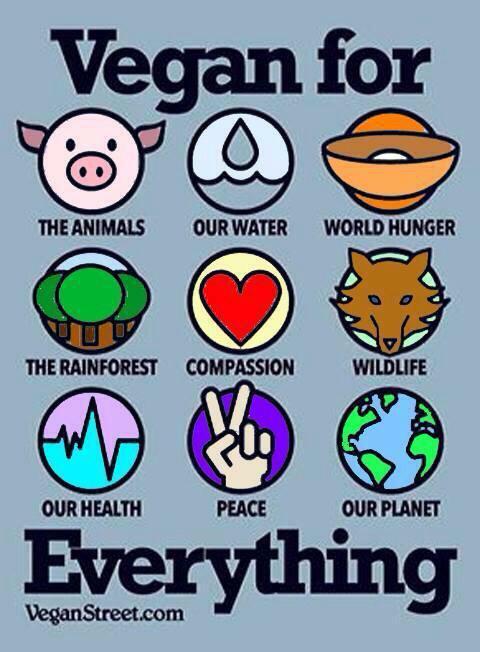 Every living thing is equal. One is not more valuable than another. 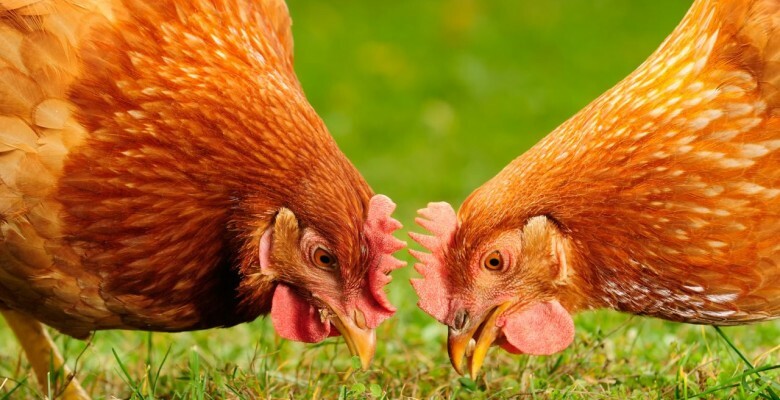 Why do we love and spoil beloved pets but eat others? WHY? Why are we disgusted over the YULIN Dog Meat Festival but lineup for ‘all you can eat chicken wings’? Why were people outraged by Cecil the lion’s death BUT find grilling a steak for dinner acceptable? Who drew this line in the sand? All animals are equal! Make the connection! 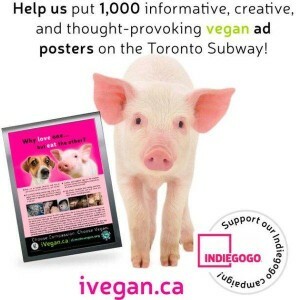 Help put ads in Toronto’s subway! As I stood staring into the tiny eyes of chickens, I realized I belong here. 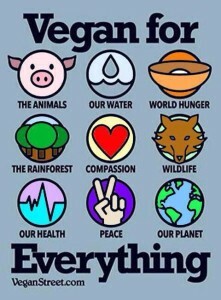 I need to do MORE than just be Vegan! This journey started long ago. I am still the little girl who wouldn’t stay to watch Ringling Bros. and Barnum & Bailey Circus. I am still the young girl who slept with her horse at summer camp. I am the still the teenager who hid a lost kitten from her parents. I am the mother who held a funeral for her son’s pet rat, guinea pig, bearded dragons, snakes and frogs. I am the woman who misses her rottie, her neo, her yorkie and her sheltie. I am NOW the woman who is going to bear witness time and time again. I welcome friends, clients and family members to join me. Please be open to understanding why it’s valuable. 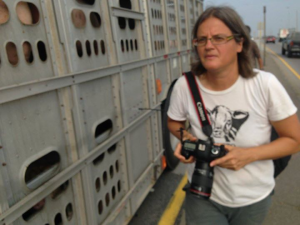 Supporting FACTORY FARMING is deplorable. I have officially found my way. I am grateful to ANITA KRAJNC for all her patience with me. I procrastinated for too long. Wearing a TORONTO PIG SAVE tank top was my first baby step towards helping a cause BUT it wasn’t enough for my heart. My heart ached for at least 5000 chickens sitting on the truck outside Maple Leaf Poultry. (100 Ethel Street in Toronto) It is hard to believe such a horrific place is nestled behind trendy Stockyards. These broiler chickens spent their entire life, all 45 unbearable days in battery cages, unable to spread their wings. FOURTY FIVE days is a far cry from the 12 year life span they should live. It’s normal for them to arrive covered in feces, sores, blood and open wounds. 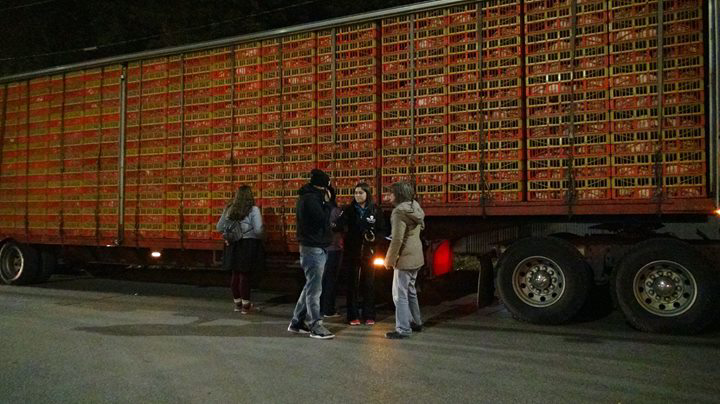 Lifeless chickens sit on the truck confined like criminals on death row. What crime have they committed? Even murderers walk outside. My new feathered friends have never walked on green grass, felt the warm sun or foraged for bugs. Instead, they were de beaked without anesthesia, fed antibiotics and hormones. They grew so quickly their legs broke under the sheer weight of their body. 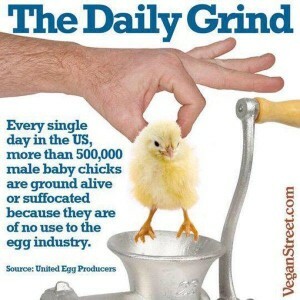 Avoid meat but eat eggs? You are NOT off the hook. 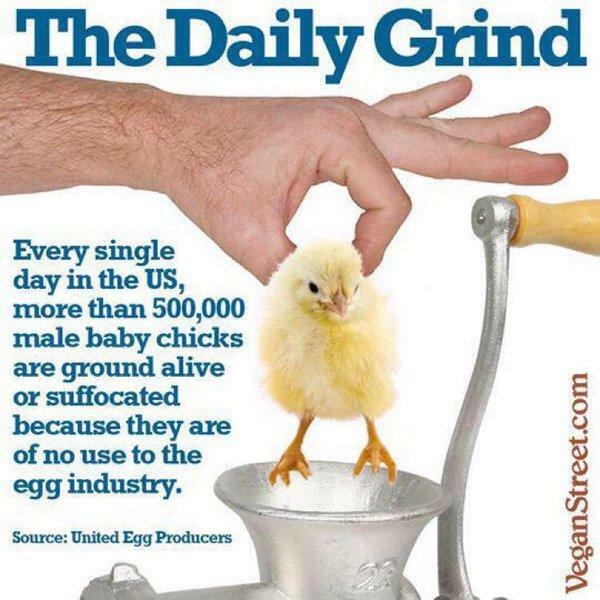 The egg industry is detestable. I want to scream at the drivers and workers, “No, they are not just chickens!”. They didn’t deserve to travel up to 52 hours without food, water or rest, only to be scalded and slaughtered. This rant could go on forever. Please don’t tell me YOU eat free range. I urge you to make the connection. The road from farm to plate is a highway of hell! Please WATCH what atrocities happen in the name of dinner. We start life with love and innocence in our hearts. Somewhere along the way it was lost. We sing Old McDonald on the way to petting farms BUT end up in KFC’S drive-thru or dining at Swiss Chalet. It’s time to take a look at our world. We our destroying our planet and ourselves. As a holistic nutritionist and personal trainer, I urge you to take a long look at the lives of all animals and your own. The SAD (Standard American Diet) centers around dairy and meat. CANCER and diabetes are on the rise. We are killing animals….and ourselves. Find your innocence…return to your childhood and make the connection. I am where I should be. Reach out and find me on facebook or twitter. EVERYONE is welcome at VIGILS. Please attend wherever you are in your journey….